What strikes me is the arrangement of the wording. I know what the advertisers are trying to do with the bold-face type. After we read "now" we're supposed to move our eyes down to "50%," and then move up to "more." But our Western habits of reading dictate that we read from left to right, and then back down to the next line. 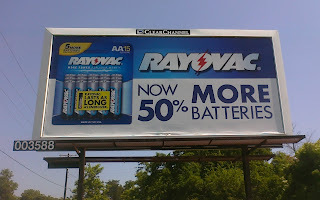 So in this way, the billboard reads, "Now more 50% batteries." I've used Rayovac batteries in the past, and I can say from personal experience that this is definitely a case of truth in advertising. What an odd thing to advertise on a billboard. Do people really think about the number of batteries in a package that much? Also, it makes no claim about the price being the same.